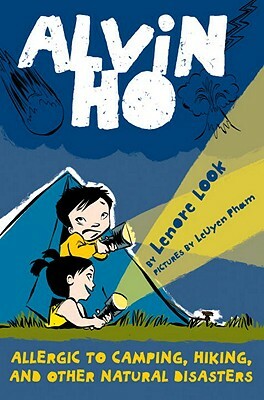 Lenore Look is the author of the popular Alvin Ho series, as well as the Ruby Lu series. She has also written several acclaimed picture books, including Henry’s First-Moon Birthday, Uncle Peter’s Amazing Chinese Wedding, and Brush of the Gods. Lenore lives in Hoboken, New Jersey. LeUyen Pham is the illustrator of the Alvin Ho series, as well as The Best Birthday Party Ever by Jennifer LaRue Huget; Grace for President by Kelly DiPucchio, a New York Times bestseller; and the Freckleface Strawberry series by Julianne Moore. She is the author and illustrator of the picture books Big Sister, Little Sister and All the Things I Love About You. LeUyen lives in San Francisco. Learn more at leuyenpham.com. "Readers can only hope that Alvin continues to describe in such wonderful detail his many allergic reactions." "While Look certainly embellishes at times for comedic effect, she has created in Alvin a character that is as real as he is irascible, and the tender relationships among the members of the Ho family provide a sturdy backbone for all the silliness. Pham’s simple but vibrant line drawings leap off the page. Another triumph for Alvin Ho."